At the standup, philosophers were known to be very great admirers of the Stoic emperor Marcus Aurelius and the wealth of philosophical teachings that he’s gifted us with. Not only was Marcus a great philosopher, but he was one of the best leaders of not only Rome but the ancient world too. It’s only natural that a great man like Marcus would dominate the Roman world, were he alive today I’m sure that he’d dominate this world too. Q. As emperor you have goals to achieve, things to do that are undoubtedly important, but good plans can be unexpectedly foiled by other people, who whether they know it or not can prevent you doing great things for the common good. How do you deal with this when misfortune strikes? Q. Yet for all of that we tend to focus on the negatives, the bad people around us that vex our spirit and sap our energies causing discord in our daily lives, what can we do to avoid this and focus on only the good. “Blame no one. Set people straight, if you can. If not, just repair the damage. And suppose you can’t do that either. Then where does blaming people get you? Q. Despite this some people are just simply harmful, they are a blight on their neighbours and society as a whole, what do we do when they try their best to ruin us? “Choose not to be harmed — and you won’t feel harmed. Q. Nevertheless these people are beyond help, they are simply bad, are they not? “Remember: you shouldn’t be surprised that a fig tree produces figs, nor the world what it produces. A good doctor isn’t surprised when his patients have fevers, or a helmsman when the wind blows against him. Q. What do you think of the gods, do they sit in judgement of mankind, interfere with the affairs of man or are uncaring of the world of men, it’s politics and the global community? In short, can the gods intervene in human affairs in a way that is harmful. Are our failures, tragedies and dashed hopes sometimes the result of a meddling god. ‘If the gods have made decisions about me and the things that happen to me, then they were good decisions. (It’s hard to picture a god that makes bad ones.) And why would they expend their energies on causing me harm? What good would it do them—or the world, which is their primary concern? ‘And if they haven’t made decisions about me as an individual, they certainly have about the general welfare. And anything that follows from that is something I have to welcome and embrace. ‘And if they make no decisions, about anything–and it’s blasphemous even to think so (because if so, then let’s stop sacrificing, praying, swearing oaths, and doing all the other things that we do, believing the whole time that the gods are right here with us)—if they decide nothing about our lives… well, I can still make decisions. Can still consider what it’s to my benefit to do. And what benefits anyone is to do what his own nature requires. And mine is rational. Rational and civic. ‘My city and state are Rome–as Antonius. But as a human being? The world. So for me, “good” can only mean what’s good for both communities. Q. But what about the afterlife, many people spend a great deal of time preparing themselves and doing good works, worshipping only one god to the exclusion of all others? Others say that there are no gods, citing a lack of evidence? Is it wise to prepare for an afterlife that may not be true or even exist? What if you make the wrong choice? Meditations 2: 11 (On the River Gran, Among the Quadi). “How is it that the gods arranged everything with such skill, such care for our well-being, and somehow overlooked one thing: that certain people—in fact, the best of them, the gods’ own partners, the ones whose piety and good works brought them closest to the divine—that these people, when they die, should cease to exist forever? Utterly vanished. “Well assuming that’s really true, you can be sure they would have arranged things differently, if that had been appropriate. If it were the right thing to do, they could have done it, and if it were natural, nature would have demanded it. So from the fact that they didn’t—if that’s the case—We can conclude that it was inappropriate. “Surely you can see yourself that to ask the question is to challenge the gods’ fairness. And why would you be bringing in fairness unless the gods are, in fact, fair—and absolutely so? Q. What are your thoughts on depression and suicide. Is it morally right to end your life when melancholia strikes you down? Q. Yet there are times when we can feel low, depressed and melancholy through no fault or obvious cause of our own. Life is often overwhelming, how do we cope with this, what can we do? “When you need encouragement, think of the qualities the people around you have: this one’s energy, another’s generosity, and so on. Nothing is as encouraging as when virtues are visibly embodied in the people around us, when we’re practically showered with them. Q. Yet we live in turbulent times, we can’t be sure of what’s around the corner, this can lead people to be very anxious and unhappy, do you have any advice as to how we can regain peace of mind? “External things are not the problem. It’s your assessment of them. Which you can erase right now. “If the problem is something in your own character, who’s stopping you from setting your mind straight? Q. So what you’re saying is that the past is dead and cannot be recovered, that we should strive to fill our remaining time with good deeds, is that correct? Q. How do we live in the present moment, and ignore the past and the possible futures that may await us? Q. Do you think of the future? Q. Death is a touchy subject for a lot of people, not everybody believes in the gods, and to those people, death may be a frightening and miserable thought, how do we counter this? Is there anything positive to be had in a death without an afterlife to go to? “I am made up of substance and what animates it, and neither one can ever stop existing, any more than it began to. Every portion of me will be reassigned as another portion of the world, and that in turn transformed into another. Ad infinitum. Q. You are saying that we don’t really pass away, we simply change form, into something else, a materialist form of reincarnation, perhaps? Is this correct? “What dies doesn’t vanish. It stays here in the world, transformed, dissolved as parts of the world, and of you. Which are transformed in turn — without grumbling. Q. If there was any good or virtuous attitude that we would do well to cultivate in life, what would it be? N.B. 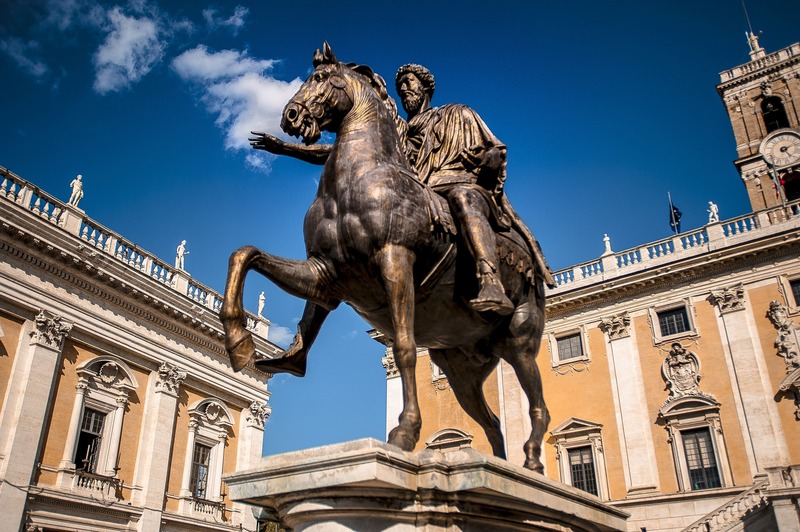 Marcus Aurelius was emperor of Rome between 161 to 180 Ad, ruling jointly with his adoptive brother Lucius Verus until Verus’ death in 169 Ad and jointly with his son, Commodus from 177 Ad until his own death in 180 Ad. He was a practitioner of Stoicism, and his untitled writing, commonly known as Meditations, is a significant source of the modern understanding of ancient Stoic philosophy. It is considered by many commentators to be one of the greatest works of philosophy. All quotes have been taken from the Hays Translation of the Meditations of Marcus Aurelius.